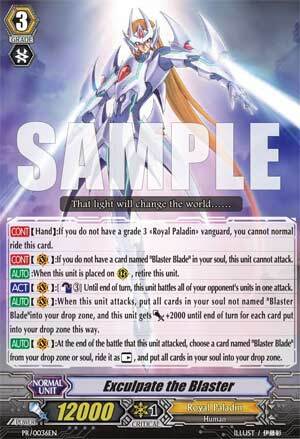 [CONT](Hand):If you do not have a grade 3 «Royal Paladin» vanguard, you cannot normal ride this card. [CONT](VC):If you do not have a card named "Blaster Blade" in your soul, this unit cannot attack. [AUTO]:When this card is placed on (RC), retire this unit. [ACT](VC):[Counter Blast (3)] Until end of turn, this unit battles all of your opponent's units in one attack. [AUTO](VC):When this unit attacks, put all cards in your soul not named "Blaster Blade" into your drop zone, and this unit gets [Power]+2000 until end of turn for each card put into your drop zone this way. [AUTO](VC):At the end of the battle that this unit attacked, choose a card named "Blaster Blade" from your drop zone or soul, ride it as [Rest], and put all cards in your soul into your drop zone. Hey, Exculpate, have you ever met this guy named Relinquished? I think you two would get along swell. *cough* So... to end promo week, we arrive at the the cluster of WHAT IS GOING ON that is Exculpate the Blaster. Supposedly this is the form taken by Blaster Blade just before inhereting Blaster Dark's sword and becoming Majesty Lord Blaster, but being a Manga card and all, he's incredibly awkward. First - Exculpate may not be ridden unless your Vanguard is already a Grade 3 Royal Paladin. This restricts his use to that of tech in a pure deck, and he cannot come down until turn 4 at the earliest. Second - Exculpate may not attack unless Blaster Blade exists in your Soul. This calls for Alfred Early levels of preparation, if not more so. Third - He cannot enter the rear-guard without selfdestructing. He's too cool for that. And with all that out of the way, we can move on to the good stuff. With 3 counterblasts, Exculpate the Blaster gains the ability to battle your opponent's entire field for the turn. If you thought Vermillion was debilitating, just think of the chaos this causes when it goes off. If the field targeting wasn't bad enough, you'll also be soul blasting everything other than Blaster Blade for an additional 2000 power a piece when performing this attack. You'll have at least 3 in there by virtue of having ridden up this far, so that's a solo 18K at its worst. Mean? Yes, very. ...but there's one more problem. After attacking, Exculpate then proceeds to replace itself with Blaster Blade once more. This means you'll need to ride a third Grade 3 on the following turn if you didn't win on the spot. So what we've got is a miracle turnaround card that drains most of your resources to bite back at whatever stands in your way. Is it good? No. Does it have its moments? Certainly. Thanks to Wingal Brave, this bad boy is actually searchable and makes for an amusing follow-up to Majesty Lord Blaster should the situation become dire. The singleton is worth a look. Just don't expect to use it as anything more than perfect guard fodder more than once over the course of a hundred or so games. 1/5 for being absurdly situational and overbearing, not to mention the epitome of poor card design. Why rated so low? Because Exculpate is an extremely niche card that, unfortunately, there just isn’t a niche for. He has so much going against him that at some point he just has to stop being able to be good. So, rather than discuss all of his skills, let’s start with all of his restrictions. 1) You can’t ride him unless you have a Grade 3 Vanguard. He’s essentially a Grade 4, for all intents and purposes. Nothing would be worse than having a Grade 3 in hand and having to misride because it’s Exculpate. 2) He cannot attack if Blaster Blade isn’t in your soul. Since Barcgal can no longer be used as a Starting Vanguard, there is no way to guarantee Blaster Blade to be in your soul, outside of Majesty Lord Blaster, who is really the only deck you can run Exculpate in. 3) If he is placed on a Rear Guard Circle, he gets retired. I can see how his higher base power (a printed 12,000) would make it harder to attack him and try to retire him, but I just felt that this was unnecessary. 1) For a cost of counterblast 3, he will attack every unit on the opponent’s field. This guy is what everyone had hoped Vermillion’s Crossride would be. EVERY unit on the opponent’s field: their Vanguard, their two attacking Rear Guards, and the three boosters they would/should have behind the former three units. That’s 5 cards that they’ll be losing. However, the Counterblast 3 cost is rather large in a Royal Paladin deck, since most of their skills require 2 or more counerblasts, and this will be locking you out of anything aside from a single Blaster Blade retire, or a single Akane call. 2) When he attacks, you dump your entire soul (except Blaster Blade) into the Drop Zone, and he gets 2,000 Power for each card. Realistically, that’s anywhere from 4-7 units, so that’s anywhere from 8,000 – 14,000 Power he’ll gain, so that’s a 20,000 – 26,000 unboosted attack that he’ll be launching at every unit on the opponent’s field. He doesn’t gain any criticals from this, and a single Perfect Guard will save the opponent’s Vanguard, but the main point is to utterly destroy their field. No matter when you use his skill, it is sure to be devastating; early game destroys their field development, but you won’t be hitting as many of their units. Late game will be sure to destroy almost an entire field, although his last skill makes this a bit more hit-or-miss. 3) After Exculpate attacks (regardless of whether or not you used any of his other skills), you pick one Blaster Blade from your soul or Drop Zone, ride it, then put Exculpate in the Drop Zone. This means his entire combo will require 3 Grade 3’s in hand: 1 to ride normally, Exculpate, then one to ride afterwards. You certainly don’t want to be sitting on a 9,000 Power Vanguard for very long, especially in the late game. This is the big tradeoff for his field-wipe skill; the later in the game you use it, the more units you’ll kill, but you’ll also be more vulnerable afterwards. If you use it earlier, you’ll kill less of the opponent’s units, but you’ll have more time to recover from riding Blaster Blade, and the opponent’s Vanguard won’t be as big a threat as it would be later in the game when they would have their Crossride or Limit Break active. So, essentially, Exculpate is just a hit-or-miss card. It can completely decimate the opponent and leave them in the dust as you continue on in the game and develop your field, or it could be completely useless to you and you’ll be forced to discard it for Perfect Guard fodder or something of the like. With all the restrictions and inconsistencies built in to him, he might be a nice 1-of in something like Majesty Lord Blaster, for the occasional ability to get his skill to work. But if you start to saturate your Grade 3 lineup with him, you’re guaranteed to be sorry. You know, its been awhile since I've wrote one of these....*sigh* well here we go. Exculpate The Blaster. The Blaster with a name I'm not entirely sure how to pronounce. So to begin, lets check the specs. 12000 Base. Okay good. Has Twin Drive!! Ballin', Is Unable to normal Ride. Yay? Requires Blaster Blade in the soul in order to attack. Okay now we're getting a little specific. Lets be honest, this card is kind of bad. By Kind of, I mean is. For starters, its requires a few specific units and such to be in certain places, thats not TOO bad, its like a forced Crossride. However, its very costly AND after you attack with it, you have to make Blaster Blade your Vanguard. So you lose 12000 base defense and are back down to grade So basically if you choose to use this card, you're taking a pretty big risk. Now its not all negative. For starters, the majority of Royal Paladin decks have Blaster Blades and use units like Wingal Brave or formerly Barcgal (#Free Barcgal). and riding a grade 3 before Exculpate shouldn't be too difficult. Also his ability to attack ALL of your opponents units in one attack while also gaining +2000 power for each units moved from the soul to the Drop Zone. So while it may have quite a few restrictions and send you down a grade, I honestly believe its not a bad "final gambit". Since you would be attacking all of your opponents units for a minimum of about 20k, even they guard one or two, you're going to be clearing out anything they have. Therefore on the following turn, you shouldnt have too much of a problem guarding the following turn. Though to get back to the negative side, his effect is rather costly, a Counterblast 3 basically means you can use one other units counterblast and thats it. So while effectively setting up for this card to reign down on everything can be fairly simple, its the rest of his effects that make it rather difficult to use.